The Kiamichi Mountains are a mountain range in southeastern Oklahoma. A subrange within the larger Ouachita Mountains that extend from Oklahoma to western Arkansas, the Kiamichi Mountains sit within Le Flore, Pushmataha, and McCurtain counties near the towns of Poteau and Albion. The foothills of the Kiamichi Mountains sit within Haskell County, Northern Le Flore County, and Northern Pittsburg County. Its peaks, which line up south of the Kiamichi River, reach 2,500 feet in elevation. The range is the namesake of Kiamichi Country, the official tourism designation for southeastern Oklahoma. Black bear, coyote, bobcat, deer, cougar, minks, bats, bald eagles, varieties of woodpeckers, doves, owls, road runners and 328 vertebrate species are native to this region. The Kiamichi Mountains are ancient. By projecting the existing mountains down to their subsurface roots geologists know that they once stood as tall as the modern-day Rocky Mountains, which are much younger. The highly serrated, jagged appearance of the Rockies and other tall mountain ranges may be attributed to their youth. By contrast the Kiamichi Mountains, which are much older—and now shorter—feature the highly eroded characteristics common among much older mountains. Geologists generally define a mountain as a natural landform topping at least 1,000 feet in elevation. Numerous of the mountains, particularly those along the Kiamichi River’s lower reaches, measure between 700 and 900 feet in elevation. Although called “mountains” they are, more formally, hills. Precise definitions of the extent and scope of the Kiamichi Mountains have never been formally assigned. They constitute more of a cultural construct than formal geographical designation. Local residents generally identify the mountains as those occurring on either side of the Kiamichi River along the full extent of its course, until it flows into the flat coastal plain of southern Oklahoma. Several groupings of mountains—all subranges of the Ouachita Mountains—may be found in southeastern Oklahoma, some of them associated with the Kiamichi Mountains, and some not. North of the Kiamichi Mountains are the Winding Stair Mountains, named by early American explorers for their cascading appearance as a series of stairsteps. 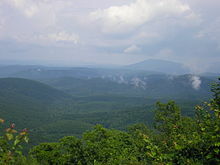 East of Little River are the Bok Tuklo Mountains, which are commonly considered a continuation of the Kiamichi Mountains, although far removed from the namesake river. These mountains take their name from Bok Tuklo County in the old Choctaw Nation. Bok Tuklo, in the Choctaw language, means “two creeks” and refers to Lukfata Creek and Yasho Creek, both in McCurtain County, Oklahoma. Portions of the mountains are protected by the Upper Kiamichi River Wilderness National Wildlife Refuge and the Ouachita National Forest. The wildlife refuge includes much of the Kiamichi River’s upper reaches and headwaters. The National Forest exists as two spurs, or arms, of its larger area in Arkansas, and may be found in Le Flore County and McCurtain County. Substantial portions of the mountains are owned by timber companies, who operate massive tree plantations consisting of fast-growing pine trees. Logging is the region’s chief industry. Tourism is also important, although it makes a smaller economic impact. The Talimena Scenic Drive, connecting Talihina, Oklahoma with Mena, Arkansas is a popular destination during autumn. Fishing is popular year-round, as is hunting during hunting season. For tourism purposes, Oklahoma’s state government for a long time designated southeastern Oklahoma as Kiamichi Country in an effort to identify and market its tourism potential, although the name has since been changed to Choctaw Country. Several flood control reservoirs built and maintained by the U.S. Army Corps of Engineers or the state, including Broken Bow Lake, Clayton Lake, McGee Creek Lake, Pine Creek Lake, and Sardis Lake (Oklahoma), are framed by views of the mountains and add to the area’s scenic beauty. Due to the restricted nature of land ownership in the region—with much of it owned by the federal government or timber companies—the Kiamichi Mountains remain rustic, rural, economically undeveloped and with few population centers. The Kiamichi Mountains experience a humid subtropical climate, with long, hot, humid summers, and short and cool winters. Temperatures below zero are very rare, but possible. Light snowfall usually occurs once or twice each winter, but rarely lasts more than 24 hours without melting. Substantial amounts of precipitation fall throughout the year. Summers can be extremely hot, and are usually very humid. Thunderstorms are common throughout the spring and summer. Higher elevations are substantially cooler than the valleys during the day, and tend to receive more precipitation throughout the year. ^ "Ouachita Mountains". Oklahoma Department of Tourism. Retrieved 2008-06-20. ^ "Kiamichi Mountains". Oklahoma State University. Retrieved 2008-06-20. ^ George H. Shirk, Oklahoma Place Names, p. 26. ^ "Seasonal Temperature and Precipitation Information". Western Regional Climate Center. Retrieved April 2, 2013. ^ "Seasonal Temperature and Precipitation Information". Western Regional Climate Center. Retrieved April 4, 2013. Kiamichi Mountains - Video footage of the area and a list of local activities and resources.